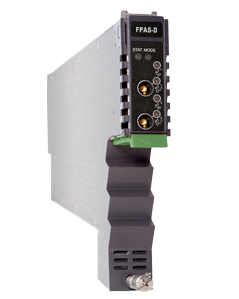 The RF Forward Path Amplifier - Standard (FPAS) is designed to plug into PBN's latest generation Advanced Intelligent Multi-services Access platform - the AIMA3000. The FPAS accepts forward-path RF signals from 45 MHz to 1218 MHz through the RF input port. The module provides an adjustable gain of 10 dB. Electronic gain and slope control allows for the module to be customized for many situations. 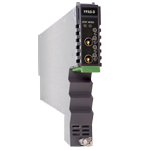 The forward-path version provides Automatic Gain Control (AGC). The FPAS can also be conveniently monitored and controlled through a computer connected to one of the Ethernet ports via the ASMM module. All module settings are retained in non-volatile memory to ensure trouble-free operation. Bulk updating, automatic uploading and downloading of configuration files can be done when using PBN's NMSE web-based management system. (1) Loaded with 77ch NTSC, RF input= 10 dBmV/ch, Gain= 30 dB. (2) Path isolation only for FPAS-D.
* 1GHz option only available for the single ports version.